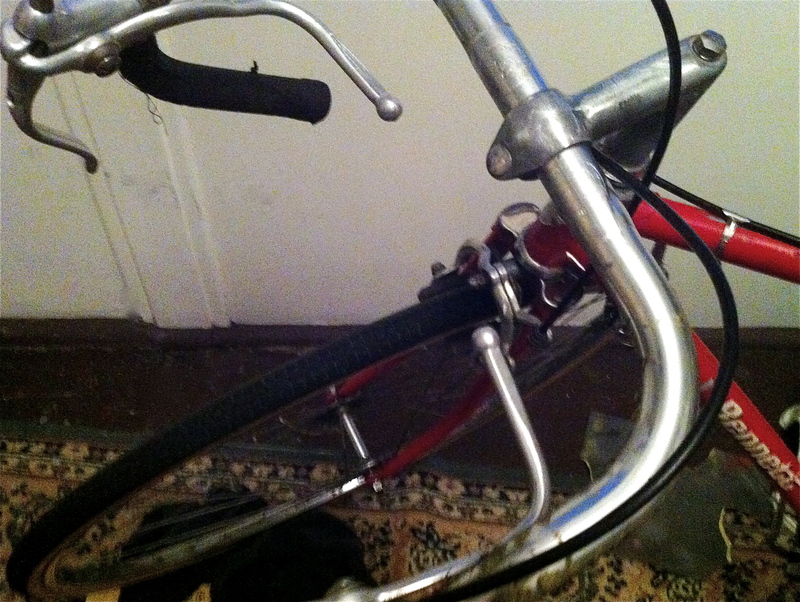 The Bennett in all its upturned-handlebars former glory …. See more pics of it on this post. Some lovely details are emerging on this Bennett as I am restoring it. The headbadge with brass rivets, which was painted over before, and the Shimano shifters which had plastic covers on them …. 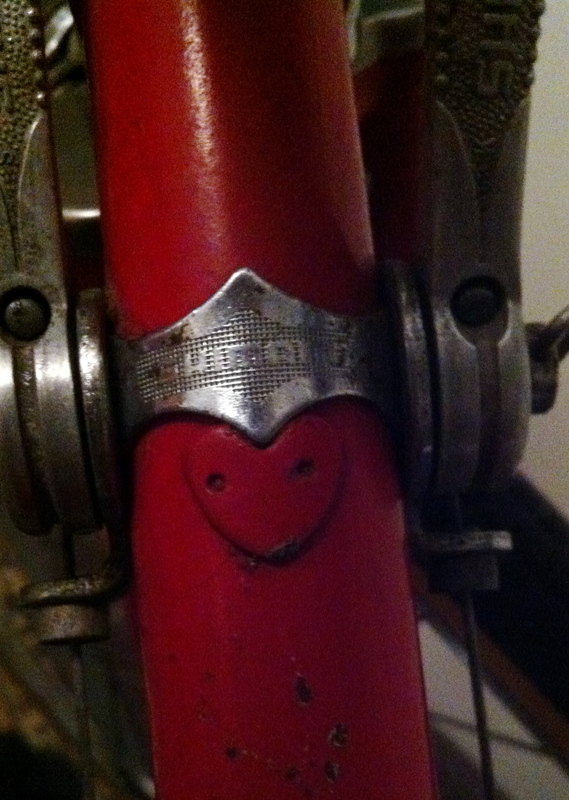 Some delightful little hearts welded onto the downtube …. This one holds the shifters in place as you can see and another one further down holds the cable in place. Cute! I am using wet and dry sandpaper on the alloy and chrome parts to restore the shine to them. Some of the rust will not come off the wheels but mostly it is finding shine everywhere! If anyone knows a quicker way to get this stuff off, it would be much appreciated! I am planning to change the colour of it, I have removed the decals from the seat tube and will paint over the remaining stickers as they are damaged and do not have any great value that I am aware of. It rides quite nicely, though the frame may be too small for me. 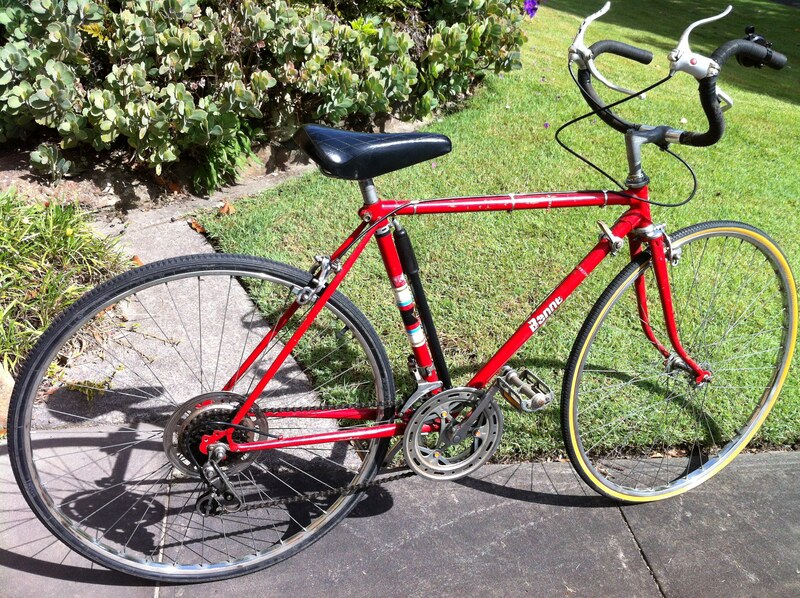 This entry was posted in Bennett, Restoration, Vintage bikes and tagged Bennett, old bike, restoration, vintage, vintage bike. Bookmark the permalink. Reminds me of my Road King but with slightly better component quality and a smaller frame. 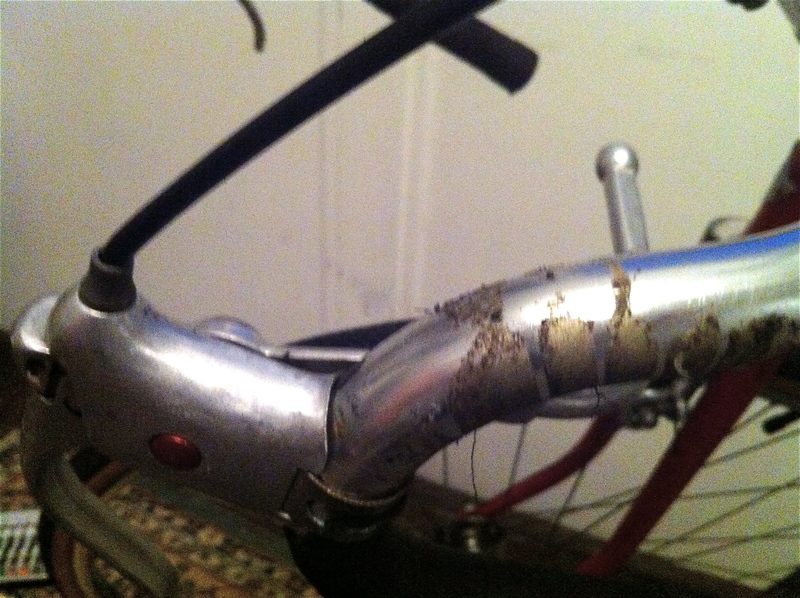 I thought that too Peter, and I am thinking of the same mudguards you put on it too! I think acetone works pretty well for removing sticky stuff from handlebars and decal residue, or orange power goo – remover for a less toxic option. It looks great so far! Fancy coating those lovely shifters in plastics! Weird! Thanks Jess, I’ll try that. Hi Viicki. I’m enjoying the restoration process and photos. Thanks Annie. I am nervous about the next step which is to take the bike apart and paint the frame, new territory for me! Petrol is good for removing the glue, don’t use wet and dry paper to remove rust from the chrome parts, a polish is best otherwise the chrome will rust even worst. the best way to remove all traces of rust is deoxidene or mix a solution of molasses and water at 1:10 in a tub and dip the parts in that, they will come out like new and it’s the cheapest and cleanest way to do it. Wow!! Molasses!! Like the stuff they feed horses? Does it have a similar active ingredient to coca cola? Hi Jess, it would be the same as it is bought from pet shops, that’s probably why you never see a rusty horse! Thanks for this info Wayne, now I know where to get it from! And I have never seen a rusty horse! Hi Wayne, thanks for these tips, I will try them. I haven’t used the wet and dry paper much on the wheels once I realise a bit of rust is quite bad so I dont think there is any damage done. Thanks for the tips Rusty! I have tried all the above except for the molasses mix. Nothing really works on the handlebar tape glue except for the fingernail method. I don’t use paper on chrome parts. There are some really large rusty bits on the front wheel, I will do another post and put up pics of it, I dont know what to do about them. Also, the headbadge seems to be made from aluminium which seems unusual to me, what is the best way to shine it up?